Here's a twist, how often do you imagine your favorite food... let's say pizza ..meshed with other ethnic cuisine? Have you tried Mexican food with Korean.. done it. Maybe French and Japanese... all the time. Maybe Spanish influenced food with Chinese.. more often than you think. Psst, some of us called it Filipino. Well, let's go with one of ever popular Italian dish of Pizza and commingled it with Indian type ingredients. What do you get? Spectacular marriage I supposed. 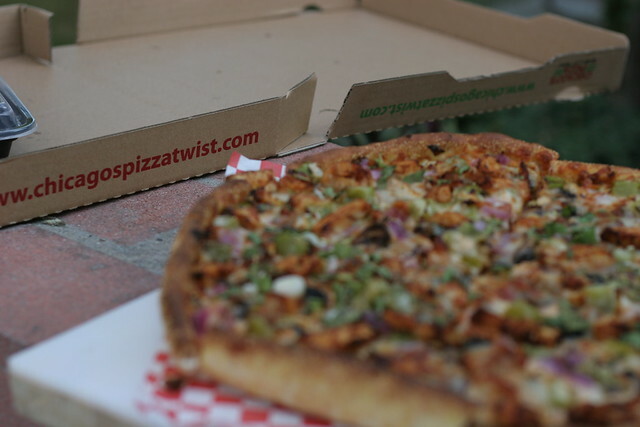 There is a fast food chain that exploded in the central Cali and recently expanded near the border of Los Angeles and Orange county called Chicago's Pizza With A Twist. Pretty big guess that they opened one up in Little Bombay (city of Artesia) that is the epicenter of all shopping and dining for Indian patriots. The big gain about this little cozy place was that it is in a booming part of the town where a Artesia is meeting a revival of newer hip places towards the south west side of the town towards the mall. At the same time maintaining the traditional old guards of the Little Bombay elements of Indian shops and restaurants. The flashback memory of me coming to this location of Chicago's Pizza With A Twist was that this dining spot used to be Scotty's Burger, a popular hangout spot for old homey style burgers. This diner looks to be kept immaculately the same as how I had remembered it. Amazingly, after a few coats of paints and maybe a new trim, it still reminds me of Scotty's. 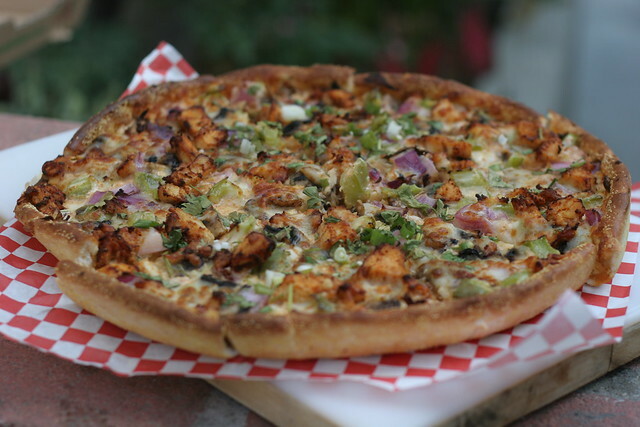 The few things that draw me to this place that I must try was the "Chicken Tikka Masala" Pizza. Few things. First, there are quite a bit of menu items to go through. It seemed they offered the traditional Italian items that you normally deduced in a pizza joint. Like pastas, wings, and run of the mill pizza. If you looked at the menu, it seemed simple enough. Then you encountered the Vegan portion. The Paneer (curry and tikka masala) and veggie pizzas listed right below them. Then came the star attraction that got me here was their chicken pizzas. Those are the ones that stood out for me with different flavored chicken and Indian influenced ingredients/toppings. There were buttered or Garlic Chicken to be had, but I really had my eyes set on Chicken Tikka Masala, where I love the flavor of chicken tikka. Plus with cheese, garlic, cilantro, and bell pepper, you would have love the item of fresh supreme pizza. The verdict: Phenomenal! It's probably one of those you didn't think it's possible, but a twist you must try just to get gist of what and how they are incorporated each cuisine and meshed into a collectible sense. 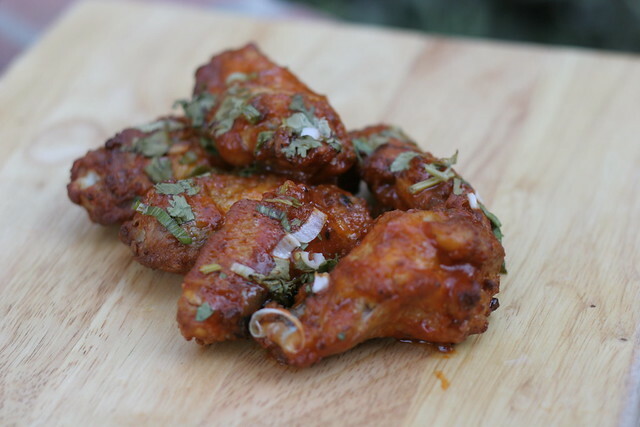 I also love the tandoori spiced chicken wings as well. The wings was probably the one that convinced me to try the pizza as I had huge craving for these much every Football Sunday. This is the question I will eventually encountered... how are they Chicago if it is not a deep dish? Obviously this is not a stuffed crust with the ingredients are inside of pie like rounders. As you can tell on the top photo where the edge of the pizza is high to give more amount of cheese and tomato sauce. That's the definition of Chicago style pizza. Of course you are amour with the stuff pizza (often associated with deep dish), that's just one type of Chicago style, but not definitive. Don't get me started on Detroit Style; apparently that is another contender for deep dish and have nothing to do stuffed either. Chicago Style Pizza. Indian ingredients. Let me be the one to tell you it does work.... with a twist.